More than any day of the month, I always dread the Wednesday morning after Patch Tuesday. Sure, I like the fact that Windows automatically keeps my system as secure as possible by automatically downloading updates during the night and applying them. But I get so frustrated the morning after. My system has restarted, and I have to go through the entire login and reload all my apps just to check my e-mail and grab my latest podcasts via the Zune software. Not a pleasant thing to go through before your first cup of coffee. But thanks to todays Tekzilla tip, no more!!! Today’s Tekzilla tip of the day discloses just how to set your system to no longer automatically reboot, but instead wait for you. It was so good I’m going to pass it along. First, you need to open the Group Policy Editor. In XP do a Start, Run, and type GPEDIT. In Vista you can also run GPEDIT from the command line. When Local Group Policy Editor opens, navigate to Local Computer Policy, Administrative Templates, Windows Components, then finally Windows Update. The row you are looking for is “No auto-restart with logged on users for scheduled automatic updates installations”. 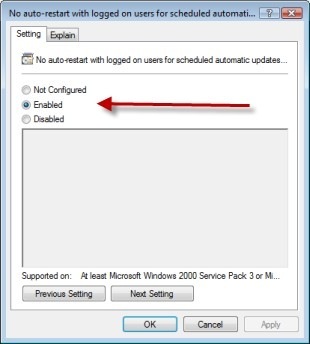 Double click on it, then change it’s state to enabled, then click OK.
You will have to reboot your computer for this to take effect. Then the horror of waking up Wednesday mornings, dreading the overnight reboot will be a thing of the past. While you are here, you may also wish to change the “Delay restart for scheduled installations” setting. By default this is set to 5 minutes. This is the screen that pops up and says ‘hey I just installed some stuff, I need to reboot to finish’ and your two choices are ‘Restart Now’ and ‘Restart Later’. But if you hit ‘Restart Later’ you are annoyed again a mere five minutes later. Well this is where you can adjust this. Open up the dialog, click Enabled, then you can change the time from the default of 5 minutes up to 30 minutes. As with any time you go mucking around in your registry or policy settings, you do so at your own risk. Make sure you understand what is going on before you go changing things. All I know is I’ll be sleeping a whole lot more soundly on Tuesday nights now. My theory is that Patch Tuesday is a job creation scheme for the lowest 25% of IT workers.